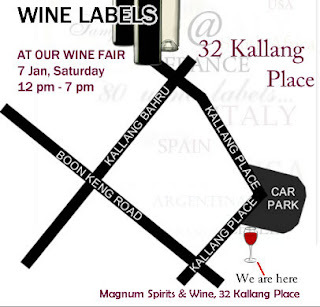 Ever been to Magnum’s wine fair before? I attended the one held in 2010. It showcased quite a good range of wines from several countries, made from different varietals and at an attractive price range. This Saturday (7 Jan) Magnum is holding another wine fair. Its held at 32 Kallang Place, from 12pm to 7pm. Wines from at least 8 countries will be sold during this fair. One good aspect of this fair is that consumers get the opportunity to sample these wines before deciding on their purchases. If you are the type of consumer who like to purchase that which pleases your palate (rather than primarily be swayed by labels), this fair should be of interest to you.